I recently tried, for the first time, to prepare salmon. Reading up on the omegas, I had learned that this pink-fleshed fish is perfect to eat when you want to increase the number of omega 3s in your diet. I searched for a recipe that would not require any frying as I wanted to avoid trans fats as well as more omega 6s in my meal. Deciding on baked fish, I marinated it in virgin pressed olive oil mixed with garlic, basil, parsley, salt and pepper, and lemon juice. The herbs allowed me to use less salt, and add a wonderful flavour to the dish. I enjoy using fresh herbs but, if they are unavailable, the dried ones work just as well. When making this dish, I have used both fresh and dried herbs. And either way, the fish tastes delicious. 1. In a medium glass bowl mix the crushed garlic, olive oil, salt, pepper, lemon juice, parsley and basil. Lay the salmon fillets out in a baking dish and cover with the mixture. Let the fish marinade in the oil for about an hour in the fridge, turning occasionally. 2. Preheat oven to 180 degrees C (375 degrees F). 3. Place the salmon in the oven and bake for 20-25 minutes, or until fish flakes easily with a fork. 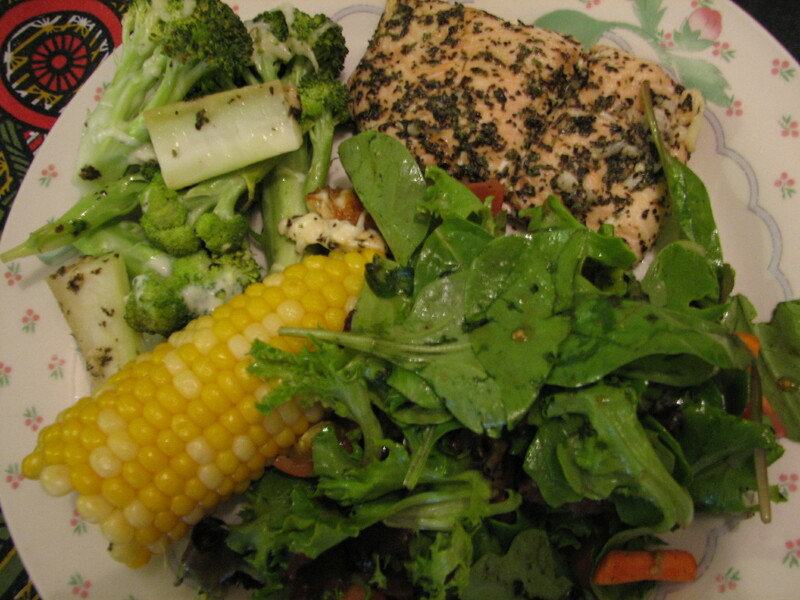 I served the baked salmon with corn as it was season, some roasted vegetables, and a large salad. Leftovers? I enjoy these the next day for my lunch: I break the fish up into bite-sized pieces and add it to my salad. Yummy! Do you eat salmon? How do you prepare it? Marinated in teriyaki-sauce and then in the oven. Colline, Salmon is a favourite fish of mine! I do it almost exactly the same way, but we looooove chilli – we grow habaneros in our garden, so I add the flesh and a light sprinkle of seeds. Fabulous! I also try to keep some for salad, but it rarely works! Unfortunately I cannot add chilli as I am allergic to it. Would give it a nice zing though! I love salmon, eat it at least once a week. With the warm weather here I will put it on the grill. I will try you recipe. Thanks for sharing. And it is perfect with a large green salad! Thanks for this Colline. I often cook salmon and shall give this a try. It sounds delicious! Let us know whether you enjoy the recipe or not. I know my family and I do. Wow. Its look like great. What I like about it as well is that it is a light dinner – perfect for these warm summer days. Hope you have left overs, I’m coming over for dinner! 😉 Looks delish. I am always for simple: simple to make and simple to taste. If there are too many flavours added to the fish, you lose the essence of the salmon. If I have salmon, it is only in a restaurant because my wife doesn’t like any fish. Looks tasty though! I would bet on the sun going west to east before seeing a conversion at this end. I also wanted to try and cook salmon, I will have to try this. I was nervous about cooking it, but I found this recipe really easy to make – and so tasty. Tell us what you think. I agree. I had never eaten salmon until I came to Canada and was hesitant to try making it. I am glad to have taken the plunge, though, as I enjoy the taste. MMMMMMMMM….that looks sooooo good! I prepare salmon almost exactly the same way. Garlic and lemon juice are musts. Fresh coriander leaves sprinkled on top does it for me. I like Leanne Cole’s version with kaffir limes..very authentically Thai. Where do you get kaffir limes Leanne? I taught a Thai cooking class years ago and that was the one ingredient I was unable to find in our very-multicultural city, which was a surprise. I was able to find galangal root in Kensington market – the place to find everything muticultural, but kaffir limes – not! Give it a try Nia – it is so easy to make. I have made it more than once now and I have not been disappointed. I love salmon marinated with a rub of miso…. let it sit overnight, pie off the miso and then grill! Sounds like an interesting alternative to prepare salmon. Love this idea. I’m gonna try it asap. Just wondering what size or weight the salmon fillets are. I normally buy the pack they sell in the supermarket that has 4 fillets. I cannot remember the weight.